Flatulence is often not discussed, and others make jokes about it. I’m sure many of us have been there; I know I have. It’s a nerve-racking and uncomfortable scenario where you’re desperately trying to hold in a smelly fart to prevent embarrassment, or having to deny it once it escapes. The truth is that farting is largely out of our control when we have a digestive condition or other related health problems. What foods you eat can also impact how a fart develops within the digestive tract. While most people fart every day, some experience excessive flatulence more often than others. What’s most frustrating is that it is nearly impossible to minimize the exact problem with dozens of potential causes of flatulence. A fart is also called flatulence, or “passing wind.” It is the internal buildup of gases that are formed during respiration and digestion. Sometimes farts can slip under the radar, while other times they can be noisy and foul-smelling. But make no mistake: everyone farts. Most healthy people fart 14 to 18 times daily, and sometimes they don’t even realize it. What causes gas accumulation that leads to your farting? While farting triggers vary from person to person, in general, gas forms the same way. Basically, gas will travel down the same digestive pathway as feces. Accumulated gas then journeys through the intestines, and out the colon. Along the way, certain things can interfere with normal gas buildup and cause bloating, indigestion, and gas pains. This is a clue that certain foods are possibly causing gut or digestive irritation. Gas and bloating are closely related because when gas is retained within the gut, various gassy symptoms and abdominal distension will result. Inadvertently swallowed air will accumulate in the stomach and is later released by farting or belching. The muscles that control the intake of air trigger this process. Eating too fast and not chewing food properly may also lead to swallowing air, and farting may result. Constipation prolongs the fermentation process of food in the digestive system, and this increases the production of internal gas. Farting will also depend on the composition of colonic microflora in the digestive system. Each person’s microbiome composition is different; therefore, variations may protect us or contribute to the excessive production and evacuation of gas. What Makes a Fart Smell? Methanethiol is naturally found in the brain and blood, and it smells similar to vegetables like cabbage of Brussels sprouts. It is the same compound that contributes to bad breath. Dimethyl sulfide also contributes to smelly veggies, and it is especially present when you overcook Brussels sprouts. When farts smell like rotten eggs, it is often because of hydrogen sulfide. This smell is not just unpleasant; it’s also toxic when consumed in high amounts. Addressing your diet is the first step to take when experiencing excessive farting. You may have an accumulation of bacteria, yeast, or sulfur, or you may have problems breaking down various foods. Foods causing excessive gas will vary from person to person, and so there is some trial and error to figure out your specific flatulence triggers. However, there are some common foods that will likely produce excessive gas. FODMAPs (fermentable oligosaccharides, disaccharides, monosaccharides and polyols) are foods that are normally healthy, but they may be tough to break down with certain people. The effects from FODMAPs will differ from person to person, and some cause digestive issues and increased gut bacteria. Some FODMAP foods will include garlic, onions, dairy, wheat, legumes, alcohol, certain cruciferous and nightshade vegetables, and stone fruit. Starchy foods like grains, nuts and seeds, beans, corn, and potatoes. Although these foods are high in fiber, they can also contribute to excessive gas. In general, high-fiber foods are therapeutic to the digestive system, and important for forming stools. Fiber also takes some time to break down, and can contribute to fermentation, and gas. 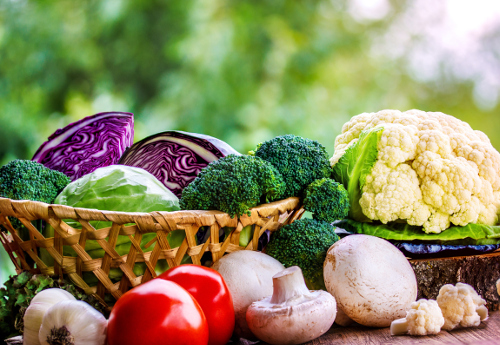 Brassica or cruciferous vegetables will cause more gas than other vegetables because they contain certain types of carbs, lots of fiber, and sulfur-containing compounds. Brassica veggies include kale, cauliflower, broccoli, cabbage, and Brussels sprouts. These veggies will form less gas when cooked than when eaten raw, but even in both scenarios they might cause a problem. It is a good idea to avoid eating too many types of cruciferous veggies in one day, and eat them in small qualities at one time. Many people are unaware they cannot properly digest foods containing milk, yogurt, cheese, or other forms of dairy. Milk and milk products contain high amounts of the disaccharide lactose that can be hard to break down. Dairy intolerance can cause noticeable indigestion and flatulence. Beans are notorious for causing gas. This is because they contain a carbohydrate called polysaccharides that are easily fermented in the gut. Bacteria thrive on polysaccharides, and the process causes fermentation and increased gas. Luckily, soaking beans and legumes overnight prior to cooking helps improve digestibility. This is a good thing since beans are full of fiber and nutrients. Making simple diet and lifestyle changes can make a big difference for reducing flatuelence. For instance, full-spectrum digestive enzymes can help better metabolize the foods you’re eating. Basically, enzymes do some digestive work for you, and they are made from things like bromelain from pineapple. Digestive enzymes will also break down amino acids, cholesterol, simple sugars, nucleic acids, and fatty acids for greater absorption and reducing the incidence of gas or bacterial residue. There are also a number of diet considerations that can reduce excessive farting, especially when related to digestive disorders like celiac disease, IBS, and inflammatory bowel disorders like Crohn’s disease. An elimination diet will remove suspicious foods, like dairy and gluten, for a minimum of 30 days, and sometimes weeks before the foods are reintroduced to the diet to help compare symptoms. If symptoms improve during the elimination period and come back once the removed foods are again consumed, this is a clear sign that these foods contribute to your symptoms like flatulence. Always test one food at a time, and not several sensitivities at once, which may lead to a false perception that certain foods cause your symptoms. Probiotic foods help stimulate natural enzymes, while preventing bacterial growth by restoring the healthy bacteria in the gut to help improve digestion. Add probiotic foods to the diet, such as kefir, kombucha, miso soup, tempeh, and fermented veggies like kimchi and sauerkraut. Various spices, herbs, and teas can help prevent flatulence and digestive issues and help breakdown nutrients. Some digestive-promoting herbs and spices to add to the diet include turmeric, ginger, cumin, fennel, licorice, caraway, and curry. For centuries, these herbs have been used to improve digestion in Ayurveda medicine and places like the Mediterranean and India. Water in general is very important when eating fiber because it helps the food stay lubricated and swell up instead of remaining hard and getting lodged in the digestive system. Drinking quality clean water every two waking hours can help ease the transit of waste matter, and this keeps the entire digestive system running smoothly. Farting is a normal bodily function, and most healthy people will pass gas 14 to 18 times each day. However, excessive farting can be a warning sign of compromised digestion and impaired intestinal dysfunction. Certain sulfur-related compounds will also contribute to the intensity of a fart’s smell, including hydrogen sulfide, dimethyl sulfide, and methanethiol. Gas can also accumulate from swallowing air, constipation, or changes in the microflora. Other underlying reasons for excessive gas accumulation include bacterial fermentation in the gut, constipation, SIBO, leaky gut syndrome or digestive problems, and food intolerance or sensitivities. Some of the worst foods that contribute to excessive gas include FODMAPs, starchy fiber foods, dairy, beans, sulfur-containing vegetables, and high-fat and processed foods. The elimination diet, probiotics, and digestive enzymes are certain ways to reduce flatulence and related symptoms. Erickson, A., “What Your Farts are telling You About Your Health,” Collective Evolution, Dec. 6, 2016; http://www.collective-evolution.com/2016/12/06/what-your-farts-are-telling-you-about-your-health/. “Here Is What Your Farts reveal About Your Health,” Healthy and Natural World; http://www.healthyandnaturalworld.com/what-your-farts-reveal-about-your-health/, last accessed March 21, 2017. “Top 10 Probiotic Foods,” Global Healing Center, January 21, 2011; http://www.globalhealingcenter.com/natural-health/probiotic-foods/, last updated July 27, 2016.